There are numerous methods of transportation to get you from John F. Kennedy (JFK) Airport to Midtown Manhattan or Times Square, in the heart of New York. The first and most convenient travel option is to go by talking a John F. Kennedy Airport taxi. A taxi from JFK operates on a flat fare of USD$52 (44€) to any location in the Manhattan area, with additional tolls, and the ride will take around 45 minutes. Alternatively, you can utilize the efficient subway system of NYC, which involves using the Airtrain at JFK to reach a nearby station. The journey will take around 60 minutes all together, including the transfer at Jamaica Station, and will cost USD$7.75 (6.67€). Finally, the cheapest but longest option is the bus. The bus can be taken from the airport to Jamaica Station and then from there to Midtown. The trip will take around 90 minutes in total and cost USD$9.25 (7.95€). For a quick (especially during rush hours) and cheap option, there is a subway service that runs from JFK Airport. If you wish to take the train from the airport into Midtown Manhattan, you will need to first take the JFK 'Airtrain', the internal train system that links the airport to the closest major subway station. The Airtrain runs between all the terminals and then to Jamaica Station, where you will be able to take the MTA E Subway line to Midtown, Penn Station, which is located within walking distance from Times Square, on W34th Street. How much is the train from JFK Airport to city centre? 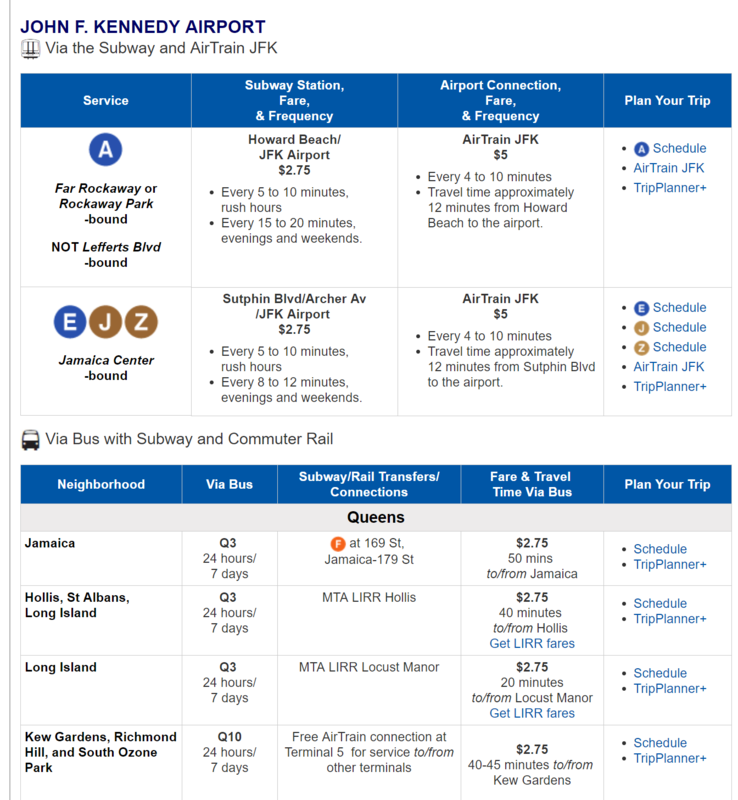 The standard one way ticket for a subway in NYC is USD$2.25, however in order to reach the station from the airport you will need to take AirTrain, which will cost USD$5.00. In total, the journey will cost USD$7.25 (6.67€). You can pay in cash at the ticket machines and offices in the station. There can be up to a 20 minute wait for the train. The MTA Subway and AirTrain JFK operate 24 hours a day, 7 days a week. The trains run more frequently during peak hours (every 3-5 or 6-8 minutes) but can be longer at other times. The subway into Midtown is taken from Jamaica Station. 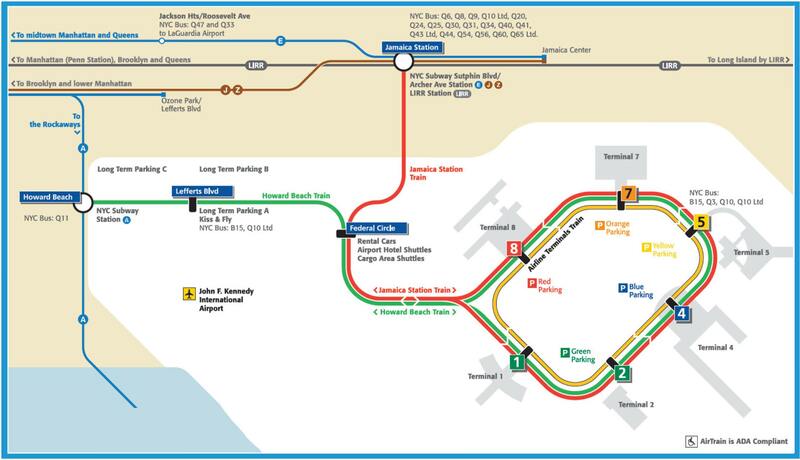 In order to get there, you will need to take the JFK AirTrain, which goes between all terminals at the station. It is easy to catch, just follow the signs in any terminal building to the AirTrain station. Despite its good price and running hours, the metro can be a hassle for those short on time or with lots of luggage as there are multiple transfers involved with taking this method of transport. 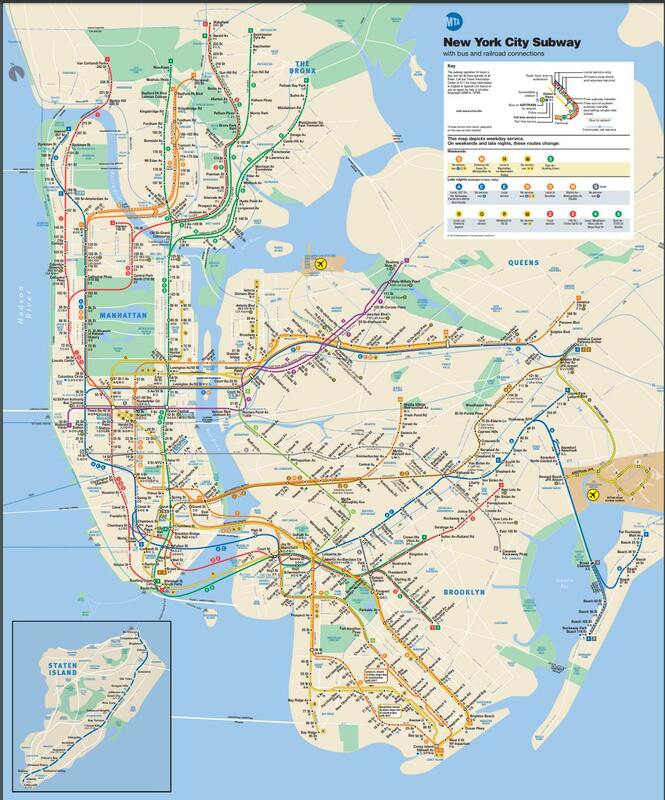 Most importantly, the subway will only take you to the central Manhattan stations and not to your end destination. The best method of purchasing bus and/or subway tickets in NYC is with a rechargeable MetroCard. You can get them from the vending machines at the stations (for $1) and they can provide bonus’ on your rides with certain top ups. They can be time based, ride based or value based. They can be purchased with cash, credit or debit. Aside from vending machines, merchants are available in the airport to sell you MetroCards. They will be wearing a red "METROCARD AGENT" vest and can assist you with any questions. You can also take the Long Island Rail (LIRR) from Jamaica Station to Manhattan Midtown. The cost is higher (USD$15) but the journey only takes 35-40 minutes. The AirTrain is free to take between the terminals at JFK, you only need to pay when you leave the airport complex on the train. A John F. Kennedy Airport taxi is by far the most comfortable option to get from the airport to the city centre. Taxis in NYC are traditionally yellow with a "TAXI" roof-sign and are numerous. There will be plenty of places in the airport where you can get a licenced cab journey into Midtown Manhattan. There will be attendants available to assist you at all taxi ranks. The journey will take around 45 minutes into the city centre, however be warned that in peak traffic it can be very slow, taking up to two hours. The ride will also include tolls, payable by the customer. Taxis between JFK Airport and the Manhattan area operate on a fixed rate (excluding tolls) of USD$52 (44€). There is no additional charge for luggage and the cost is per car. There is a USD$1.00 Peak-Hour Surcharge between 4:00PM to 8:00PM, Monday to Friday. NYC Taxis are controlled by law and therefore you can be ensured that any taxi taking from a designated rank is reliable and safe. As well as this, taxis provide door-to-door service and are the most comfortable option for those travelling with luggage. It is always best to avoid rush hour if you wish to make it to the city centre in reasonable time, as traffic can be extremely bad. Trips beyond the city limits are either charged below the flat rate or have the portion of the trip beyond the city limit doubled! NYC Taxis are able to accept credit/debit/prepaid cards, but do not have to accept individual bills over $20. You will be expected to pay any tolls along the road from the airport to the city centre. Any return transfers from the city to JFK Airport are not charged at the flat rate, but are metered instead. You cannot call and book a city cab. They must be flagged down or taken from the ranks. A 20% tip is expected for taxis in NYC. The bus routes from JFK are numerous, however they require extra time as more stops are taken along the way. The price also does not vary much from the train. In order to get to Midtown you have to take the bus Q3 from Terminal 5 at JFK to Jamaica Station. From Jamaica Station you are able to take any of the marked 'QM' Express buses into Manhattan. Each of these services takes the same route out of Queens but varies slightly in the route that they take throughout Manhattan, so you are able to check which one goes closest to your destination. How much is the bus from JFK to city centre? The bus from the airport will only set you back a very reasonable USD$2.75 (2.40€). However if you take the express bus service into Manhattan, you will need to pay an additional USD$6.50, making the whole trip around USD$9.25 (7.95€). Tickets are purchasable from the machines at the stations, either individually or with a MetroCard. There can be up to a 15 minute wait for the bus. Buses run on their own timetables and are not 24/7. It is always best to check the timetables on the MTA website before relying on a bus. The express bus services leave from Jamaica Station, so in order to catch one you will need to take the Q3 bus which leaves from Terminal 5 at JFK to reach Jamaica Station. Although it is cheap, the bus is a very long transit for those who have just had a long flight. As well as this, the express bus service is not always reliable and times are different for every bus which can cause extra stress and time. Standard MetroCards allow free transfers between subways and buses within a 2-hour period, as do normal tickets. However, the express bus routes are not included. Be prepared to pay and have exact change. Many New Yorkers consider the express bus route a safer option to the subway. If you are unable to meet a time suitable for the express bus, Jamaica Station has other options, such as the subway, available. You can top up your MetroCard so that it has enough credit as it can be used on the express buses. How much is a taxi from JFK Airport to New York City Centre? Taxis from JFK to Midtown Manhattan operate on a flat rate which is USD$52 (44€) to any location in the Manhattan area, with additional tolls. How many transfer options are there from JFK to New York City Centre? There are 3 ways for you to get to Midtown Manhattan from JFK Airport; taxi, train or bus. A taxi will be the quickest but the most expensive, followed by the bus and then the train being a good balance between cheap and quick. How far is JFK Airport from New York City Centre? The JFK Airport is located around 25.7 km away from Manhattan and the drive will take you approximately 45 minutes in normal traffic. The route will also include tolls.